Part of the reason we live here is the culture. China fascinates us, with its rituals and teachings. And, of course, it has enormous business potential. And to ensure that business isn’t disrupted by national holidays and vacation periods, today we’re sharing the calendar of Chinese holidays so they don’t affect your hardware imports. 1. You will demonstrate empathy if your decisions with them follow that tradition. 2. Without a doubt, when working with you, your Chinese collaborator will notice it. In addition to considering the Chinese and world economy when importing, we recommend having a calendar handy of Chinese holidays so they don’t affect your hardware imports. That way, you can better judge when to order and when to travel to Guangzhou. If you’re already one of our clients, IBMH will help you make that decision. We’ll put all of our experience in the industry and in Chinese traditions at your service. This is not a complete list, but it does contain the most important dates. We’ve listed those that have the potential to paralyze local and international business. Learn the dates of the main Chinese holidays so they don’t affect your hardware imports. Take note! This is the country’s BIG FAMILY HOLIDAY. All of China goes to reunite with their families. It begins with the new moon and finishes with the first full moon on the calendar, 15 days later. • It usually falls 20 to 30 days later than on our Gregorian calendar. In other words, late January/early February. 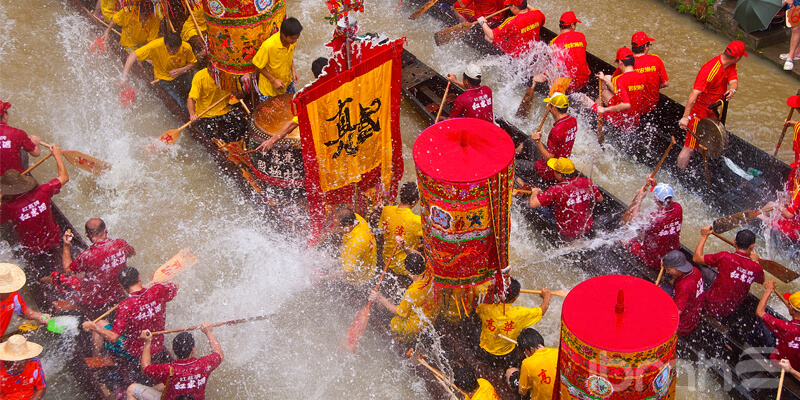 • The Chinese start to travel about ten days before the festival. Internal activity slows down for a few days. This is something to keep in mind when it comes to production. • It closes with the Lantern Festival: red lanterns are the international symbol of China and represent good luck. Also called “All Saints Festival” in other countries, it is celebrated in the month of April. Honor is paid to ancestors, graves are cleaned, and everyone goes out to enjoy spring and fly kites. In several Chinese cities, like Shanghai for example, they celebrate the Festival of Flowers. In the past, kites had long strings to which red lanterns were tied. Once in the sky, the string was cut, and with it, the sicknesses and bad energies of the year. In April and May, the Dragon Boat Festivalis celebrated, which we have already covered in a previous post. Don’t forget that this is a perfect opportunity to come visit us here at our offices in Guangzhou, one of the most famous cities for this festival. This is celebrated on the 7thday of the 7thmonth of the Chinese calendar (in 2018, this will be in mid-August). This is an ancestral date in China that commemorates the day of love, the one day of the year in which two stars, Altair and Vega, are united. A week of annual vacations and tourism that kicks off on October 1, the day commemorating the creation of the People’s Republic of China in 1949. It’s the time of year when the Chinese travel the most. Although an increasing number of people celebrate Christmas, or the end of the lunar year, it is still minor compared to the holidays we mentioned above. Even so, keep it in mind; you never know. These celebrations are the ones that can cause the most delays in your orders because they involve simultaneous vacations of many industrial and logistical sectors. Filling you in on the Chinese holidays so they don’t affect your hardware imports is our way of helping you improve business. Whenever you like, we can help you organize your own calendar of imports from China. Here at IBMH, the entire Chinese zodiac is looking forward to collaborating with you: grinning tigers, prudent rabbits, elegant dragons, wise serpents, talented horses, sensitive goats, clever monkeys, proud roosters, loyal dogs and scrupulous pigs… and, in general, a highly professional team!